This week, I was happy to attend the annual gala to support the Inner City Scholarship Fund of the Catholic Schools Foundation. 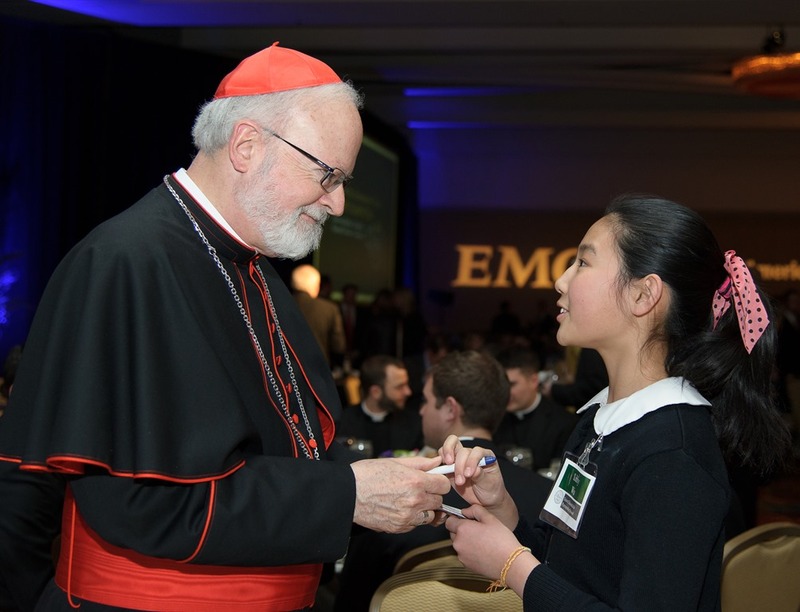 About 1,000 people attended the gala, which raised over $3 million to support Catholic education in the Archdiocese of Boston. 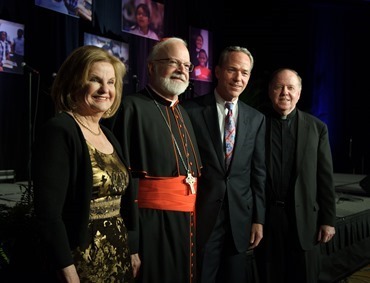 We are very grateful to all who attended and to Peter and Carolyn Lynch who, over the last 20 years, have contributed over $100 million in scholarships to the inner-city schools in the archdiocese. John Fish was the chairperson for the dinner and Mary Richardson was the emcee of the evening. We were also very fortunate to hear a performance by Ronin Tynan. 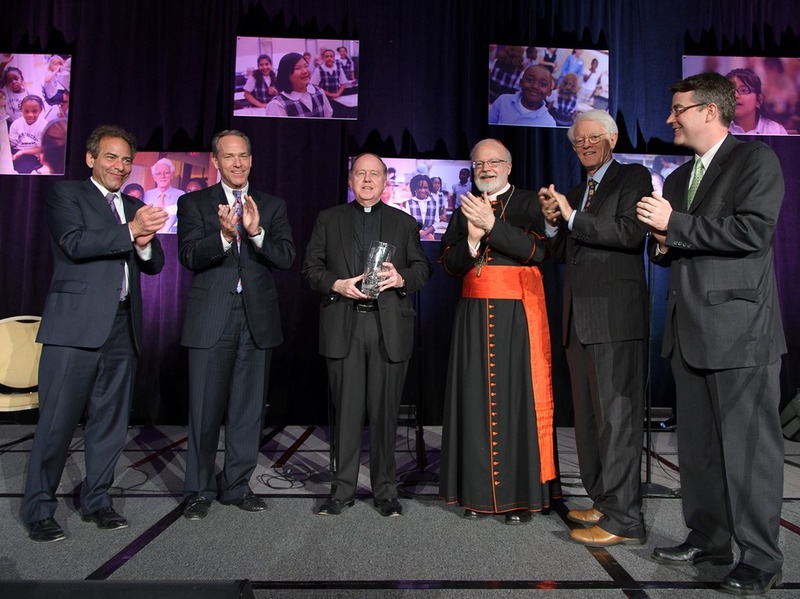 During the dinner, Boston College and its president, Father William Leahy, were honored for their work forming a partnership with St. Columbkille School that has been very successful in keeping the school, not only operating, but thriving. 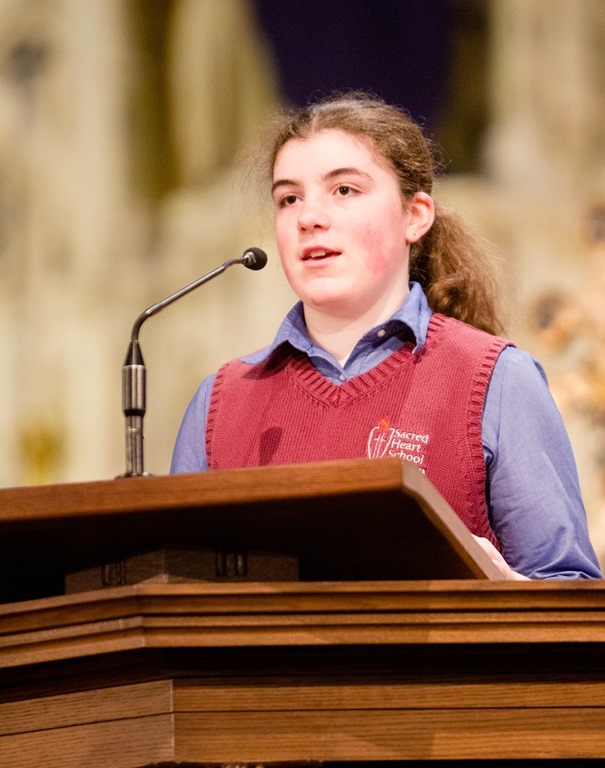 There were two student speakers during the evening: one, a graduate of St. Columbkille’s who is now in college and the other was Carlos Tamayo, an eighth grader at the school, an immigrant from Colombia. He did a wonderful job talking about his experience of Catholic education. He thanked his parents who have worked so hard — seven days a week under very difficult circumstances— so that he can have a Catholic school education. 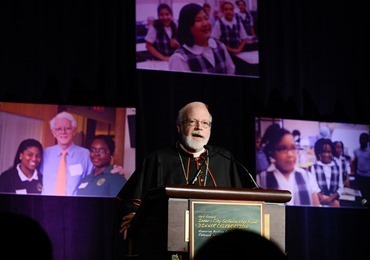 He repeated several times that a Catholic school education is the best education anyone could get. I think that is a sentiment we can all agree with. 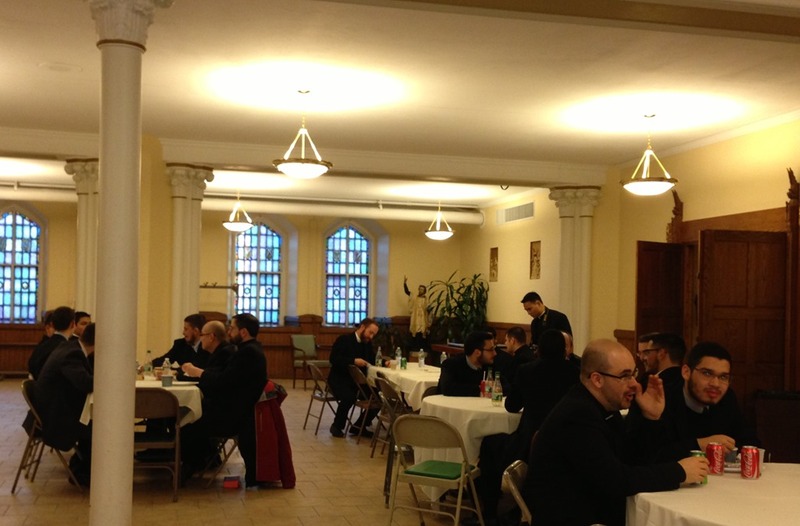 Last Friday, we held one of our periodic gatherings with seminarians at the Cathedral. We had Vespers and a dinner followed by our usual conversation. 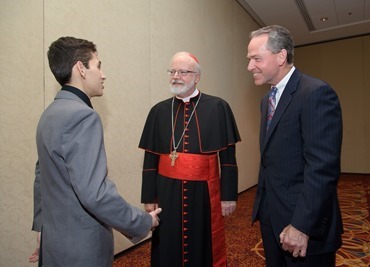 I was able to share with them some of my experiences of the conclave in Rome and we had a very uplifting dialogue about the conclave and the new Holy Father. Sunday, of course, was Palm Sunday. 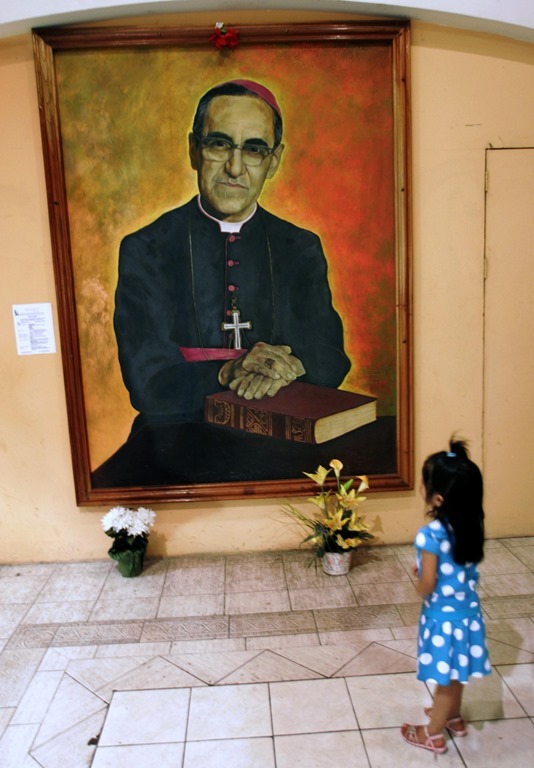 As I pointed out in my homily, it was also the anniversary of Archbishop Romero’s death. Strangely enough, his funeral was on Palm Sunday and this year the date of his funeral and Palm Sunday coincided. For much of my 20 years in Washington I was working, in great part, with refugees from El Salvador. 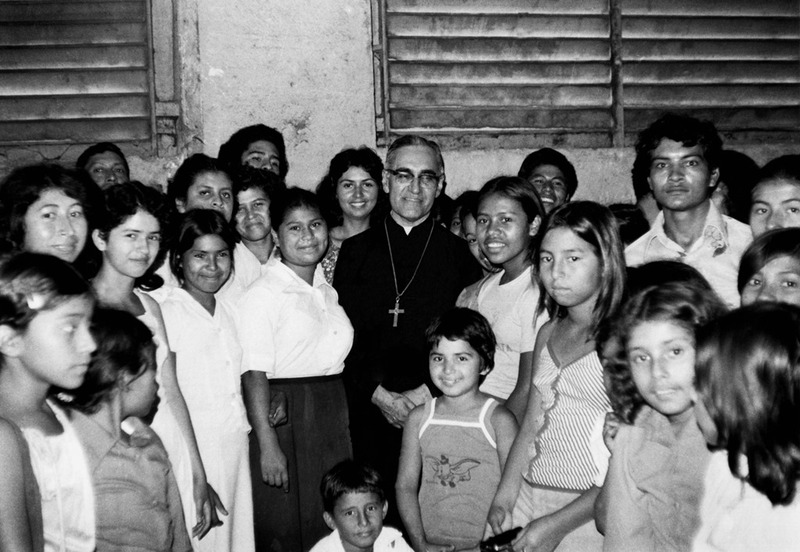 Priests from the Washington Archdiocese were also working in El Salvador itself — including one who was sort of a shirttail relative of mine — so I was very in tune what was happening in El Salvador. Then, I spent a month at the 1979 Pueblo Conference in Mexico and there I got to know Archbishop Romero well. Then in the years at the Centro Catolico I had a great deal of contact with him. He was an extraordinary figure in the history of El Salvador. 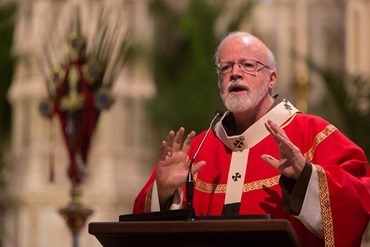 I was always so impressed that every week he would say Sunday morning Mass at the Metropolitan Cathedral in San Salvador. This Mass was a radio Mass and throughout El Salvador even the poorest campesinos had their transistor radios and were listening to his sermon. As I mentioned in my homily, the day before he was assassinated he had called on the Salvadoran military to obey God rather than their superiors and to stop killing innocent people and to end their oppression of the populace. The next day he was shot at Mass at the divine providence Catholic hospital there. I have celebrated Mass at that altar since and it is always very moving for me. 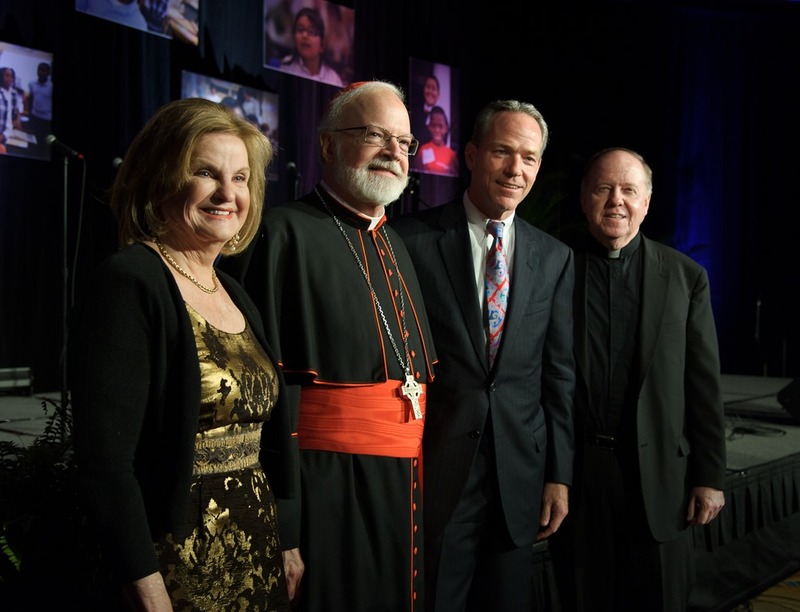 His cause has been introduced for canonization. 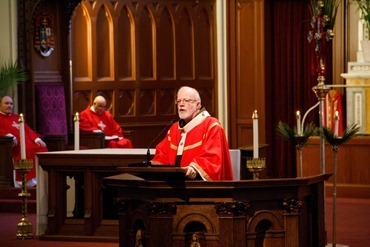 On Palm Sunday, I talked about his Palm Sunday Funeral Mass, to which thousands and thousands of Salvadorans came. The army threw teargas at them and shot into the crowd killing 40 people. It was just a horrific moment. But Pope John Paul II introduced his cause and I understand that Pope Francis is very interested in moving the cause along. This would be a great thing for the people of El Salvador, who have a great devotion to him. 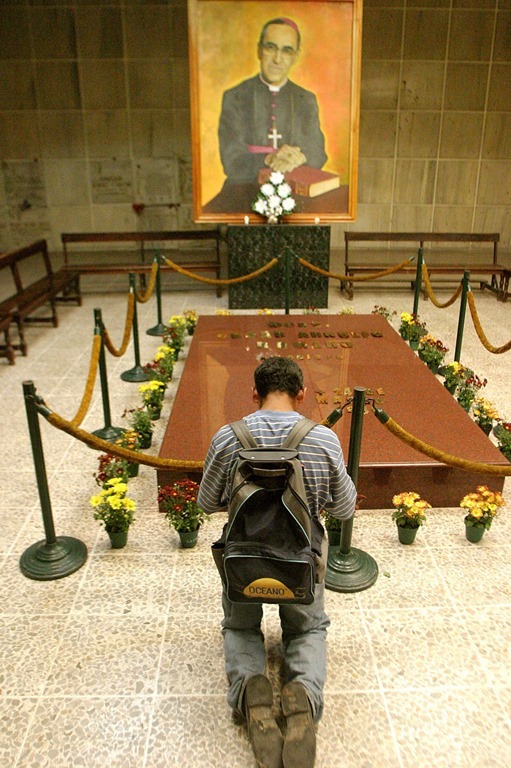 His tomb at the Cathedral has always been revered by the people of El Salvador. 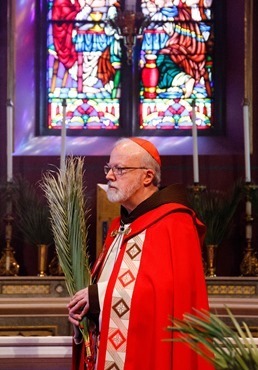 For us, Palm Sunday is always very important because it marks the beginning of Holy Week and, this year, it also comes just after the election of our new Holy Father. There is a real sense of excitement and enthusiasm for Pope Francis and for his great simplicity and his devotion to the social gospel of the Church — that same gospel that Archbishop Romero died defending. As a child, I remember my Nana talking about the Great Atlantic and Pacific Tea Company, which turned out to be the A&P Supermarket. Our parish priest sometimes talked about A&P Catholics. I thought he meant people that shopped at the A&P supermarkets; actually, he meant “Ashes & Palms” Catholics. These are the Catholics that come to Church on Ash Wednesday and Palm Sunday. It occurs to me that some of you might be A&P Catholics, but even if you are, I am so happy that you are here. I want to ask you to join our frequent flier program – every Sunday, the rewards are out of this world, and we promise you an upgrade! Actually, we are all A&P Catholics, all touched by these powerful symbols. Here, gathered at the altar, we are Christ’s family. It’s not about being entertained, but about entertaining angels. 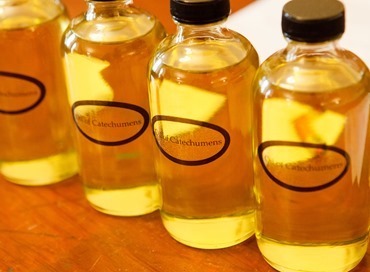 Here, like at our Thanksgiving Day meal, we discover our identity as members of this family. The Word of God, the Bread of Life, and the witness of our brothers and sisters in the Body of Christ, the Church. 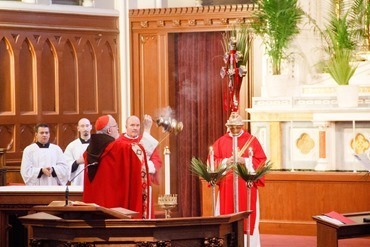 The ashes and palms are important symbols for us Catholics. 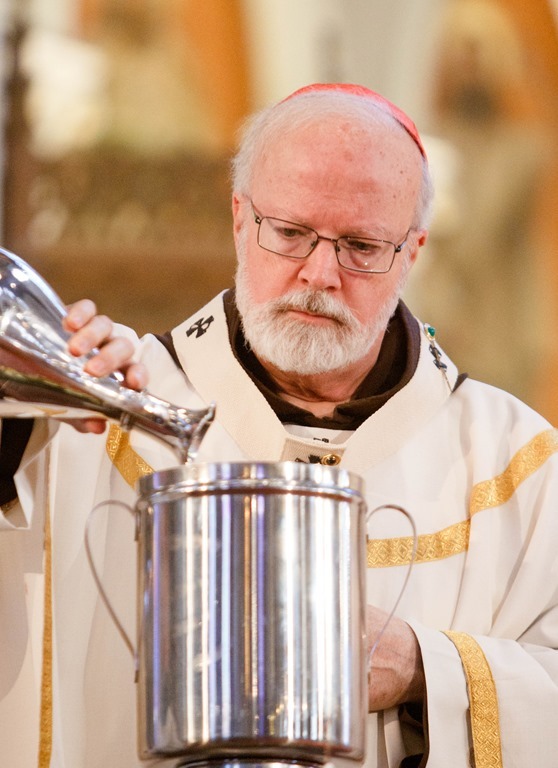 The ashes on our forehead as we begin the 40 days of Lent are a sign of our mortality, that we are pilgrims, that life, the time we have here, is precious and we must use it well. The ashes are given in the sign of the cross, because although we are dust, as the words of Genesis remind us, the dust has been redeemed. The ashes are a sign of conversion, the need to grow in the faith and overcome our selfishness, sinfulness and learn to love God and neighbor. 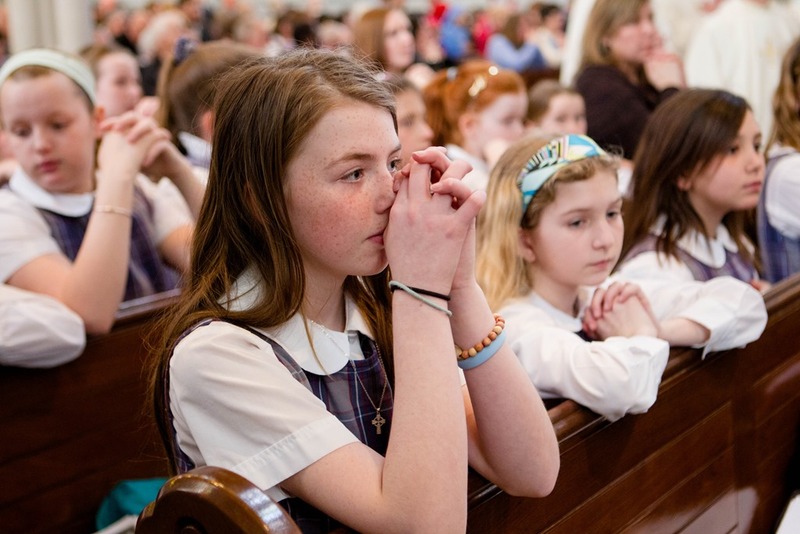 An important part of our conversion is the discovery that we are all loved by God. We are not orphans, free agents, or lone rangers. God loves us even when we are in sin like the Father of the Prodigal Son, who loved his son even when he left home. 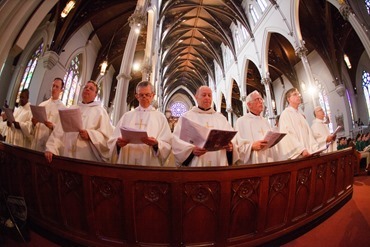 Palm Sunday means Lent is drawing to a close, and Holy Week is beginning. Today’s first Gospel describes the triumphal entrance of Jesus into Jerusalem. St. Luke organizes his whole Gospel around a trip, Jesus’ pilgrimage to Jerusalem. The goal of Jesus’ life on earth is to go to Jerusalem, and there to die on a cross to pay for our sins, simply because He loves us. The Pharisees were unhappy with all this and said to Jesus, “Teacher, rebuke your disciples.” Jesus told them that if the disciples were to keep silence, the very stones would cry out. 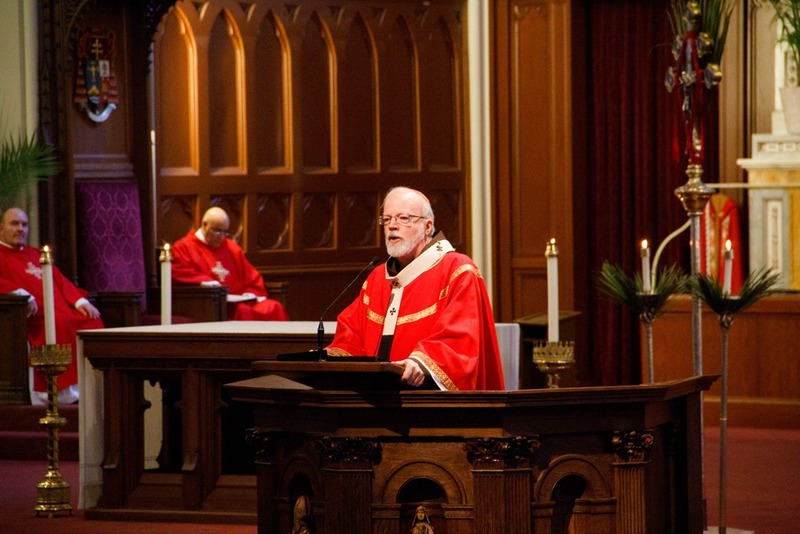 Palm Sunday offers us a glimpse of Jesus’ glory that places Him above all creation. Even the stones will praise him. There are stones everywhere in the Holy Land. That phrase, “the stones would cry out,” always captures my imagination. This Gospel as mentioned takes place as Jesus passes by the Mount of Olives. The Jews believed that the Last Judgment will take place there in the Kidron Valley. For that reason, Jewish people have wanted to be buried there. Visiting the Mount of Olives, you see so many graves, all covered with little stones. When a Jew visits a grave, he places a stone or a pebble on the tombstone. In the last scene on Spielberg’s film, Schindler’s List, the Jews saved by Oskar Schindler are filing by his grave on the Mount of Olives, each placing a small stone on it. They put the stones to create the shape of the cross. Those are the same stones that Jesus knew would cry out Hosanna and which glorify the humble Messiah entering the Holy City on a donkey. These could also have been the stones that St. Paul before his conversion along with his confederates may have used to stone to death the holy deacon, Stephen, the first martyr of the Church. In these Gospels, we see the costly grace of discipleship in the face of persecution and the Cross. We see a huge throng of fair-weather friends who joyfully celebrate the triumphal entrance of their king, but dump him a few days later because of expediency or fear of Christ’s enemies who call for Jesus’ death. There were also some who joyfully accompanied Jesus on Palm Sunday like the Apostles who, filled with shame and fear, fled for their lives. Among them was Simon Peter, the first Pope. Jesus told Peter that He was praying for Peter so that his faith would not fail, and so that once Peter recovered from his fall that he would strengthen his brethren. This is one of the principal tasks of Peter’s ministry: to strengthen our faith, and to unite us in one body, one family. The Gospel accounts do not try to disguise St. Peter’s humanity and his shortcomings. When Jesus first called him to be an Apostle, after the miraculous catch of fishes, Peter threw himself at Jesus’ feet and said, “Lord, depart from me, for I am a sinful man.” Jesus does not depart from this simple and sinful man, but chooses him to be the head of his Church. I am enthralled by Peter’s humanity. He is a combination of Ralph Kramden and Archie Bunker. Even today’s Gospel reminds us of his shortcomings. Having boasted that he was prepared to go to prison and even death for Jesus, Peter eventually denies even knowing Jesus – and not to a soldier with a long knife, but to a waitress with an attitude. Today’s Gospel shows us that same vacillations between reckless abandon and sheer cowardice that evidenced itself when Peter jumped out of the boat to walk on the water toward Jesus, lost his nerve and began to sink in the waves. In Luke’s Passion, when Judas and the soldiers arrive at Gethsemane to arrest Jesus, Peter brandishes his machete to defend Jesus and chop off a servant’s ear. Peter wasn’t even a good aim. And he runs and he hides. He then tries to follow Jesus at a safe distance. We can follow Him only up close. Peter wept because of his cowardice and learned to follow Jesus up close. Peter ended up in Rome, the capital of the world, and there on Vatican Hill, he was crucified in Nero’s Circus, upside down. Peter asked to be crucified upside down because he was unworthy to die like Christ, his Master. Peter is buried under the high altar of St. Peter’s Basilica in Rome, but his ministry continues. The keys that St. Peter received form Christ are passed on to a new fisherman. That is what the whole world was watching when the white smoke issued forth from Sistine Chapel. 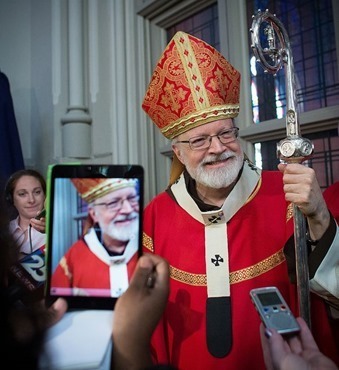 The keys of spiritual authority that Christ gave to Peter have been passed to a new Peter, an Argentine Jesuit who has taken the name Pope Francis and has captured the imagination of the world. He is not the Christ. He is the fisherman, like Peter he will have his liabilities and shortcomings, but like Peter he is the Vicar of Christ and has come to confirm us in our faith and lead God’s people in the path of faithful discipleship. Francis had a love for the poor. He marks his conversion from the moment he encountered a leper. Francis’ first impulse was to run, but God’s grace changed Francis’ heart and he rushed over to kiss the leper. 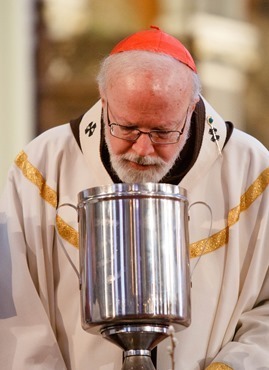 For Francis, the poor person, the sick, outcast, were all a sacrament, a sign of the crucified Christ. They are as Mother Teresa used to say about the poor: Christ in a distressing disguise. 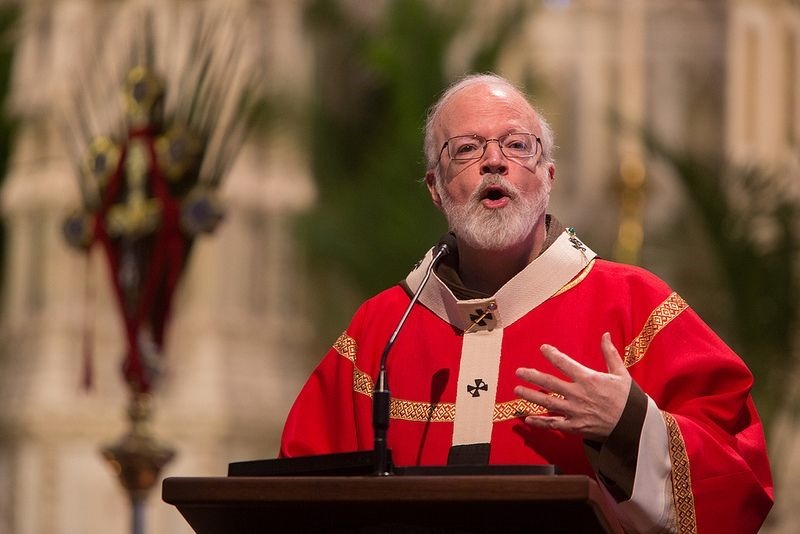 Our new Holy Father is an eloquent exponent of the Church’s social Gospel and will help all of us to refocus on our mission to serve the poor, the sick and the abandoned. Pope Francis comes from Latin America, where almost half of the world’s Catholics reside. 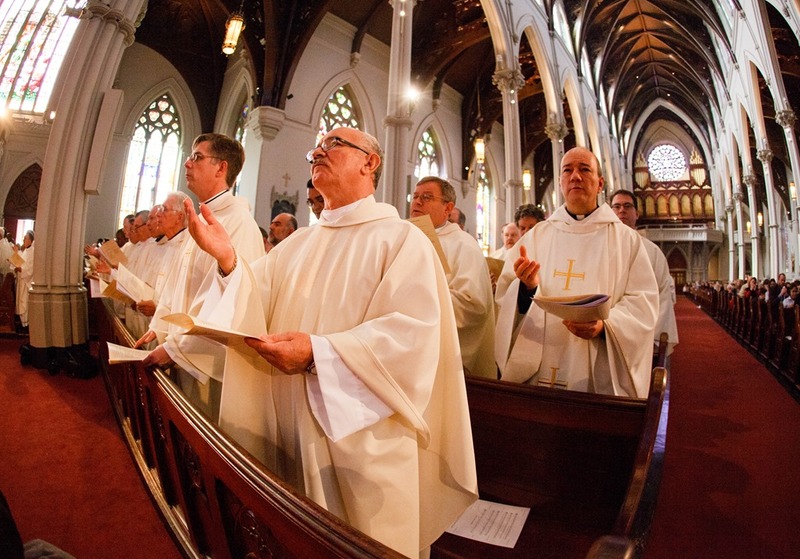 Indeed, almost half of the Catholics in the United States are Hispanic. 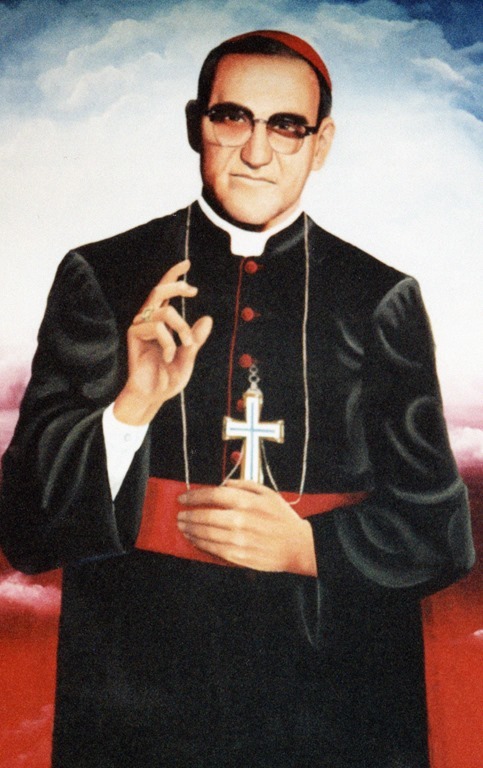 I am confident that God in His providence has given us an Hispanic Pope for a purpose. This Year of Faith is going to be a time of surprises. The images of the Conclave and the Mass of Inauguration should remind us that we are a world-wide family, over a billion strong. We have a mission to make God’s Kingdom more present, to build a civilization of love, where the Gospel is preached to the poor and to all. To follow Jesus up close is not easy. The world will ridicule us and try to trivialize our faith. We must not be surprised. We began our Lenten Season with ashes on our foreheads and now we draw near Jerusalem, Holy Week, with palms in our hands. Look at the stained-glass windows. Many of our brothers and sisters depicted there are ashes and palms Catholics. The ashes of repentance and the palm is for victory. In our iconography, when a saint is a martyr, he or she is depicted carrying a palm branch of victory. The word martyr is the Greek word for witness. We are all called to be witnesses for our faith, willing to suffer inconvenience, embarrassment, or event persecution to stand up and be counted as one of Jesus’ disciples, brave enough to follow him up close. Today is an emotional day, the anniversary of the murder of a man whose friendship I cherished, and whose life fills me with admiration. On March 24, 1980, while celebrating the Mass at the Catholic Hospital “La Divina Providenca” Monsignor Oscar Romero, Archbishop of San Salvador, was murdered, one day after a sermon broadcast throughout the whole country in which he called on Salvadoran soldiers, as Christians, to obey God’s laws and stop carrying out the government’s brutal repression. Archbishop Romero’s funeral was held at the Cathedral on Palm Sunday – the largest event in the history of that country. The Army opened fire on the crowd. 40 people died, many were injured in the panic that ensued. When the plaza emptied and the smoke lifted, all you could see was shoes and sandals that fell off people’s feet as they fled and stepped on each other’s feet. Shoes, sandals and palm branches. Let us carry these palm branches with the courage and the joy of those who have gone before us in our 2000 year history of our Church, built by Christ of living stones on the Rock of Peter. 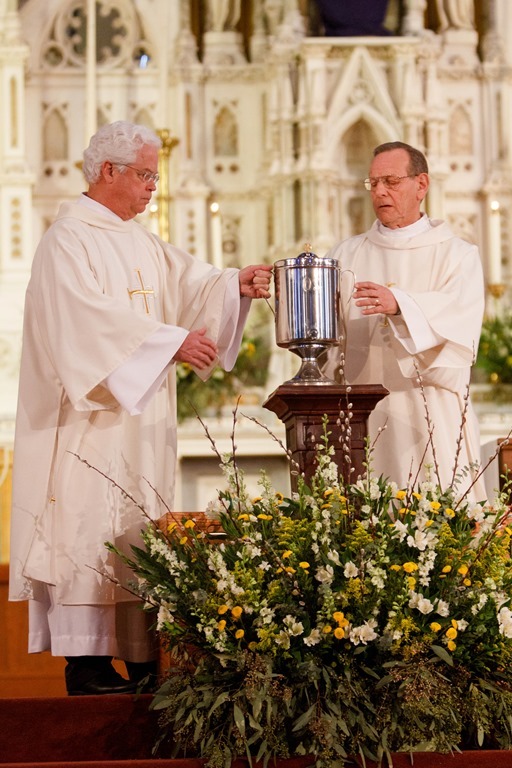 Another wonderful symbol of this great feast of Palm Sunday is that the palms blessed here today will be burned to make the ashes for next Ash Wednesday. We are always on a journey, struggling like Peter, with our own weakness, often having to start all over again on the journey toward Jerusalem. But we are not alone; we are surrounded by a cloud of witnesses waving the palm branch of victory. In this Holy Week, we shall relive the great events of Jesus’ last supper, where he gives us the gift of Himself in the Eucharist. We relive the sacrifice of Calvary, where Jesus saves us from sin and death, and finally the joy of Easter, the most important day of the year. We celebrate Jesus’ victory over death. Our Redeemer lives and we can live forever in His love. This is the Year of Faith. 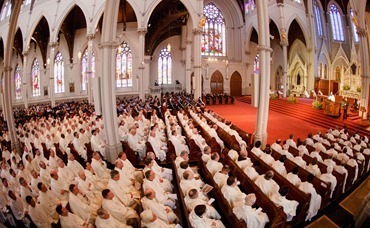 Let us recommit ourselves as Christ’s disciples, let us learn more about our Catholic Faith, so that we can live it more generously, more faithfully, more joyfully – and so that we can be witnesses, inviters, evangelizers, sharing the treasure with those who do not yet know Christ, so that others will discover the joy of being part of Christ’s motley family, the Church, with ashes on our foreheads and palm branches in our hands. Tuesday, we had a wonderful turnout for the Chrism Mass. During the Mass, we bless the oils that are used as the tools for the administration of the sacred mysteries and the Sacraments during the year and it is also the time when we renew our commitment to our priestly promises and service to God’s people. 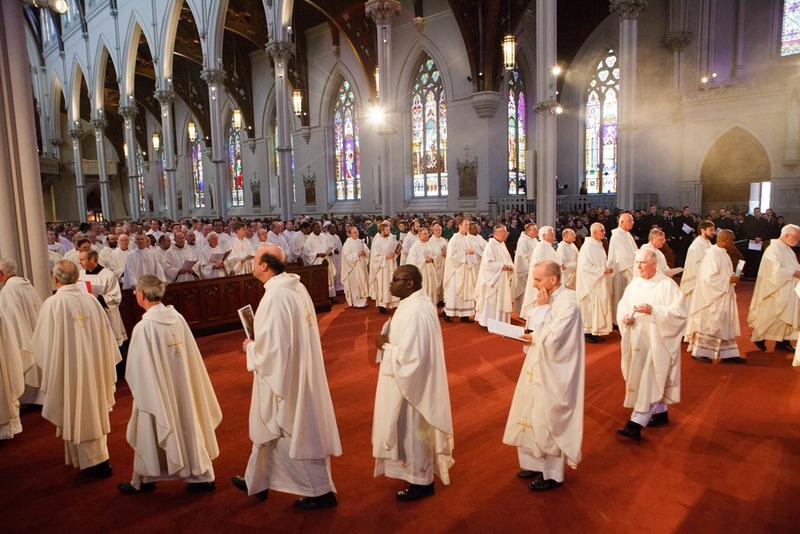 For me, it is one of the most important celebrations of the year because it is an opportunity to be with our priests and to reflect with them on our vocation as Catholic priests. 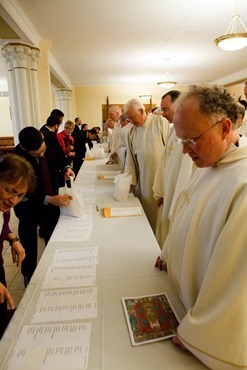 We also pray by name for each priest who has died in the last year and cannot be with us. This year it was wonderful to have a full Cathedral, including so many students from our Catholic schools who joined us. 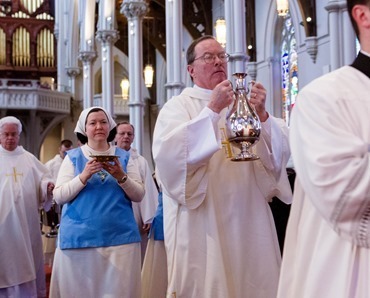 Very few Catholics ever get a chance to see a Chrism Mass since it is celebrated only once per year and only celebrated in one church. 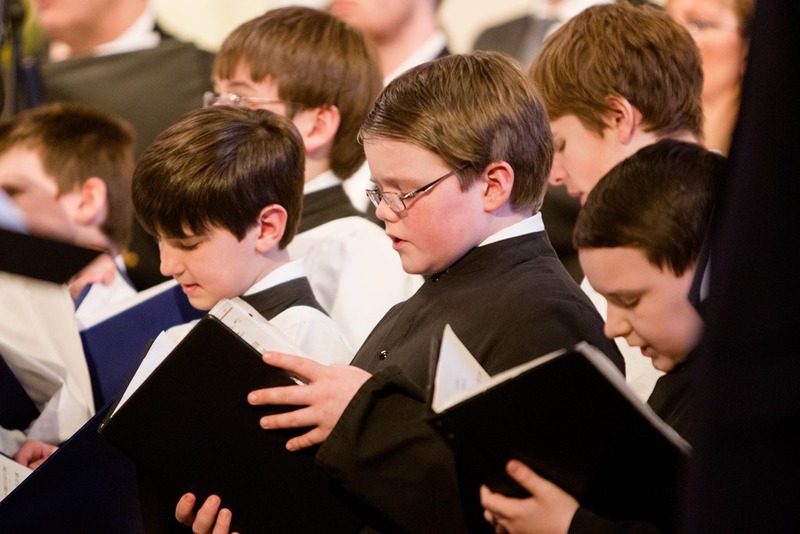 So, having the students come, and the fact that it is televised on the Catholic TV Network, allows more people to participate in this marvelous event, which is a celebration of the priesthood and the sacraments of the Church. 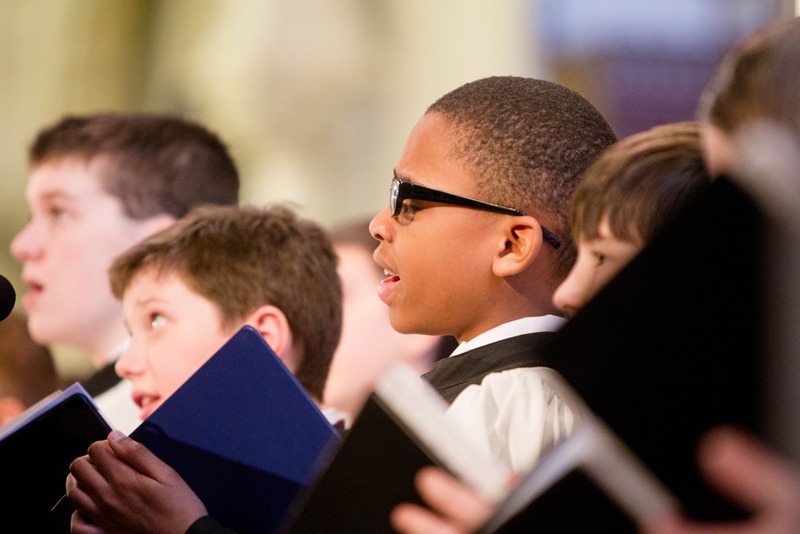 This year we were also very blessed to have the students from St. Paul’s Choir School sing at the Mass. I was very happy that the other schoolchildren got to hear them, because I think many of the schoolchildren do not even realize there is a choir school in the archdiocese. 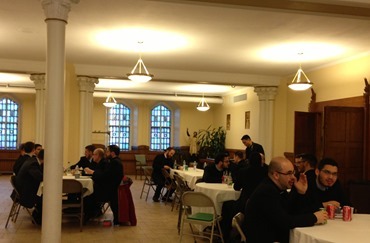 After the Mass, we have a lunch with the priests, during which we honor two men for their service. As I said to the priests at the luncheon, so many of them deserve to be honored, the great difficulty is always selecting only two. 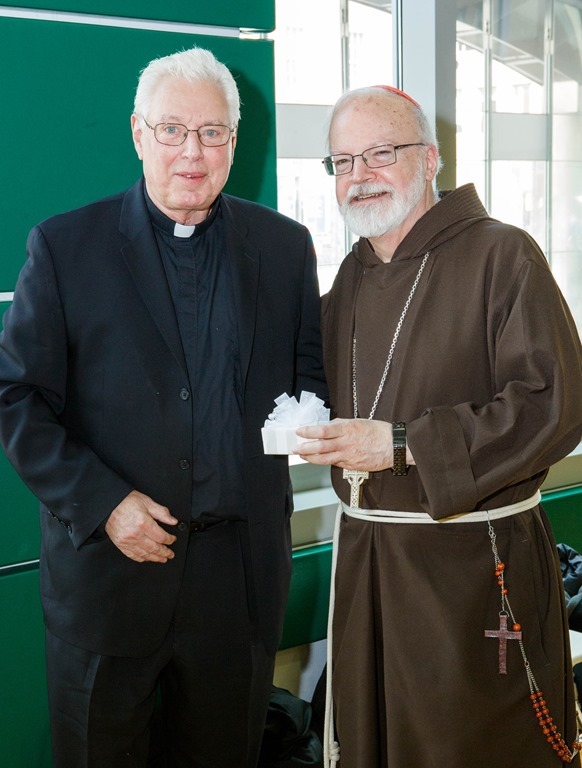 This year, we honored Father Arnie Colletti and Father John Sheridan. 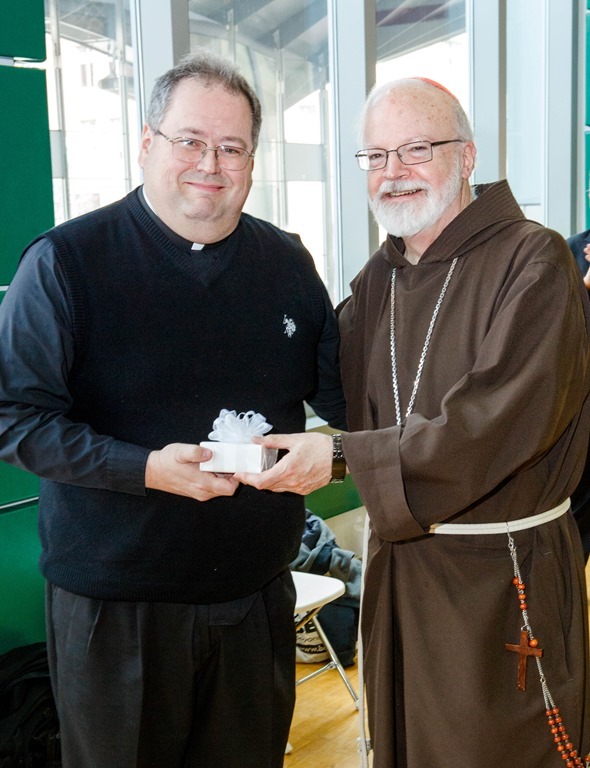 They were presented with a gift of cufflinks with the seal of the archdiocese. Both of them addressed their fellow priests after receiving the award. Father Colletti, who is almost 80, was very funny in his remarks because he said “This is like one of those lifetime achievement award they give you at the end.” He also added that he had been hoping I would be elected pope so his award could have been being made Archbishop of Boston! 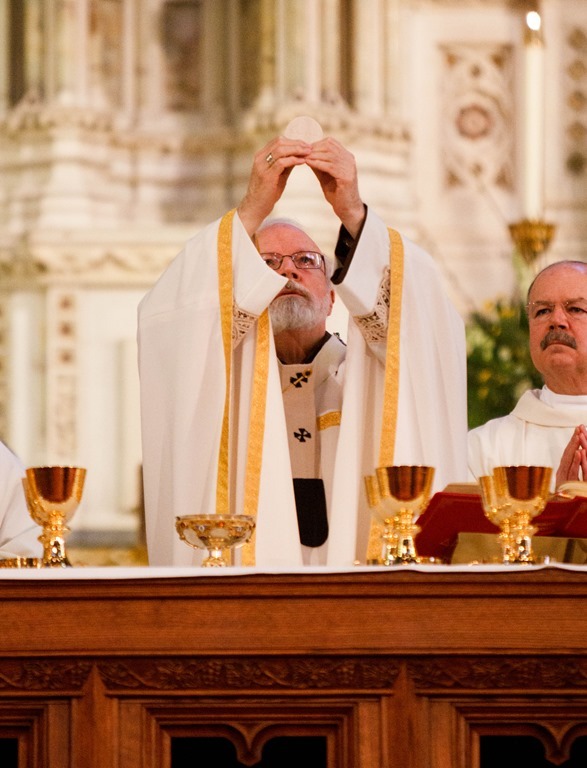 Holy Thursday is the day of the Eucharist, the day of the priesthood. 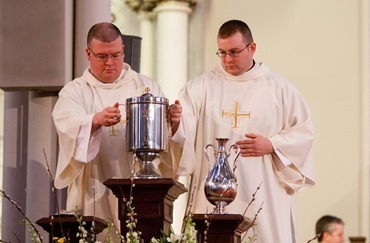 The Chrism Mass is, in fact, a Holy Thursday Mass but we anticipate it to allow more priests to be able to attend. But this year, as part of Holy Thursday, I had dinner with our retired priests at Regina Cleri. 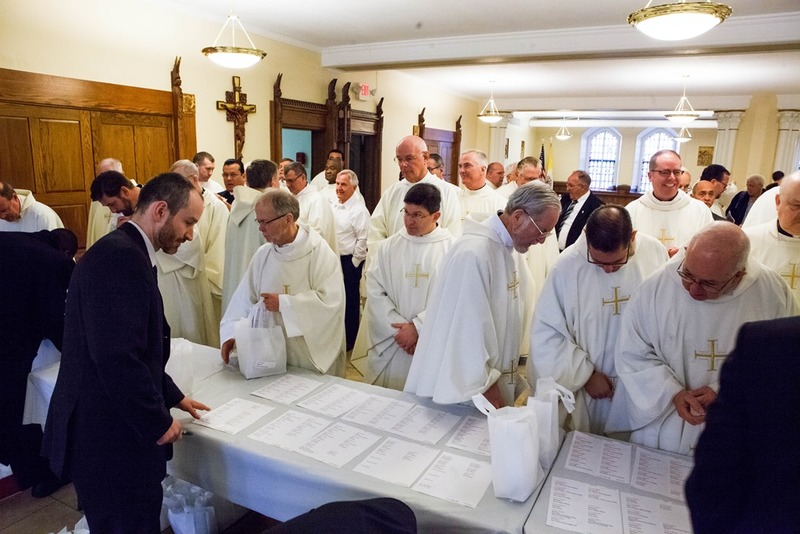 It was an opportunity to be with them and to express our appreciation for their many years of faithful service to God’s people as Catholic priests. 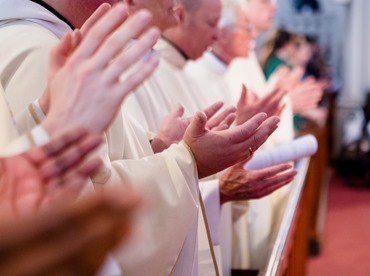 This time with our retired priests is an opportunity to remind everyone in the archdiocese that the collections that are taken up in the parishes on Easter Sunday are precisely to support our retired priests. thank you very much. Each post is very interesting and it’s useful for us to know something about the American Catholic Church. I attended a Catholic school (Figlie di Maria di S. Antonio Maria Gianelli) and my three kids too. Now they are twenty, seventeen and eleven and here in Italy it’s very expensive and it’s a big sacrifice for all the family: the government doesn’t help us and there is a big crisis here at the moment. Anyway, we think that our choice was the best for our children. Thank you, each post is a chance to learn something new or to get to know other realities! 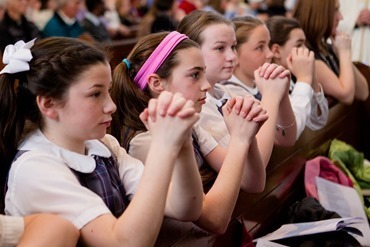 I attended a Catholic school, too (an Ursuline school in Italy, excellent education! ), and I remember our meetings with Cardinal Carlo Maria Martini, who was Archbishop of Milan at that time (about twenty years ago), and that was very meaningful to us students.